Unsecured garbage is irresistible to bears and quickly leads to bears frequenting homesites and neighborhoods leading to conflicts. Due to human safety concerns and the ability to prevent conflicts, some cities have created laws or ordinances that prohibit garbage being left out and available to bears. Missoula Ordinance Number 3419 requires the special management of garbage in the “Bear Buffer Zone” within the city of Missoula where there is increased potential conflict with bears. Secure your trash. 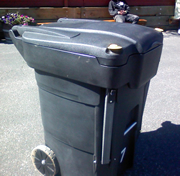 Keep all trash and recycling in a secure building, garage or shed, including bear-resistant garbage cans when possible. Put out trash only on the day of pick-up. Bear resistant garbage containers may be available in your area. By storing bear-resistant garbage containers in a building or shed until the day of pickup you may lengthen the life of the container and minimize damage from a bear trying to get in. Contact your local garbage hauler. Your local hauler is an important part in reducing garbage as an attractant. Here are a list of haulers in your area and some of the bear-friendly options they offer. Always check with your hauler before purchasing a bear-resistant garbage container. 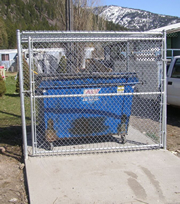 Seeley Lake Refuse District: There are a limited number of bear-resistant garbage containers available for seasonal check-out – call (406) 677-3809 for information.